What Book Should You Read On Valentine's Day? Feel like reading a good love story around Valentine's Day but don't know which one you would like? Take this quiz until 12 February and find out now with what novel you should curl up that day! Five amazing novels await to be discovered. If you like your result, make sure to drop by our library and borrow that specific book and many more. 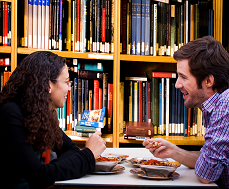 And if you want to make your own romance worthy of the literary classics, leave us your contact details for the chance to win a romantic Valentine's dinner for two in the British Council library in Bucharest on 14 February. Please note that the competition is open to participants over 18 only. For more details, please visit the British Council website (www.britishcouncil.ro) or contact us at [email protected] / 021 307 96 00. The information you provide us is necessary for enrolling in the British Council library Valentine's Day competition. We will only use your contact details to inform you if you win the prize. These details will not be used by third parties. British Council Romania is legally bound to respect all the rights granted by law 677/2001 (the right to information, access, intervention and objection to data). Upon your explicit request at no. 021 307 96 00, we can update or delete your personal data.